oh my. this thread is dying. time to feed it. 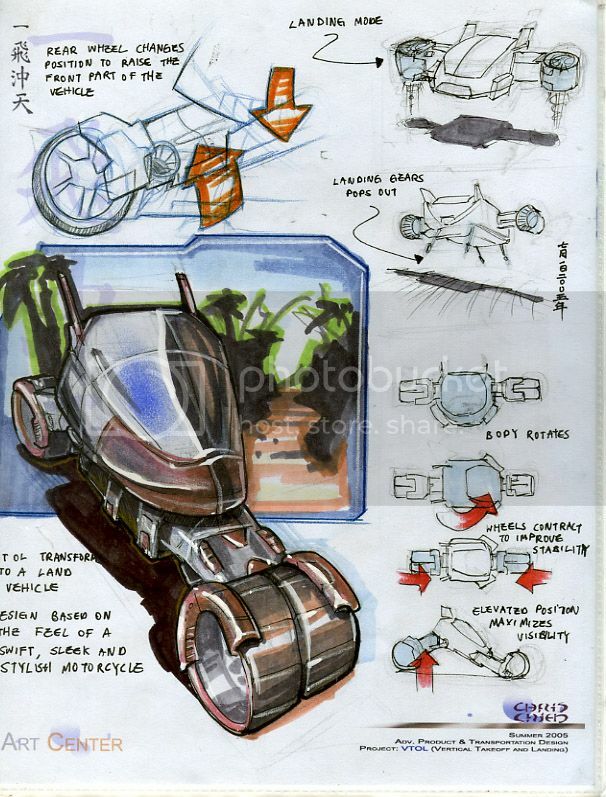 Im nearing the final design of my product but I'm still going to spead on more week doing exploded views, orthographics, detailed views, and of course some styling and mechanics stuff. The vehicle is capable of traveling on land/air/water, and would be useful during specialized missions such as search and rescue, as well as military operations. I know that the practicality of the vehicle isn't very ..real. This was my fault because I first designed a vehicle based on its functionality rather than its purpose. I should thought more about purpose. During these sketches, I really tried working on detail of the functions and craftsmenship. Some of these sketches took me up to 3 hours for one. :\ If anyone has any tips, they would be appreicated. Man, I really wish I could have been here to take the advanced class with you guys now, after seeing some of your renderings. 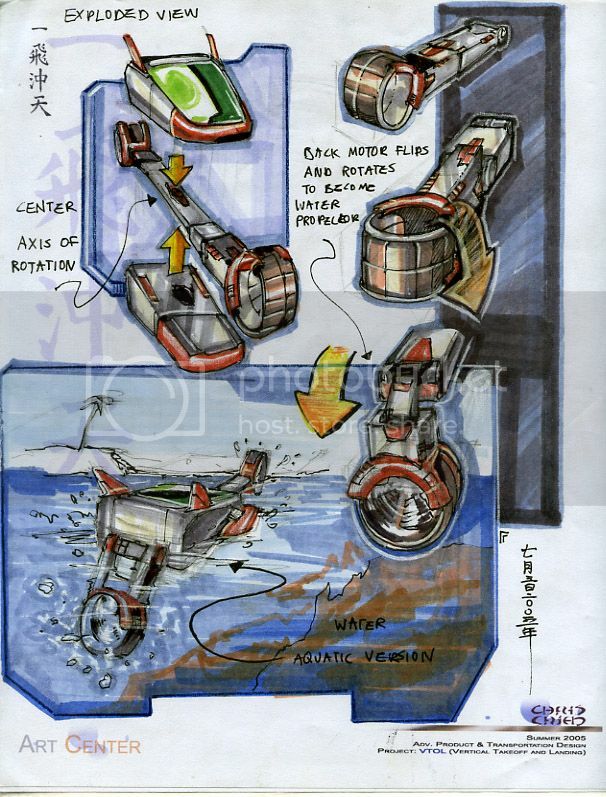 I really like some of the concepts here. Will I see any of you this fall in the advanced class? Hey, I was thinking about this about couple of month ago. I tried to come up with a few concept here and there. But I conclude that, nothing can beat the good old helicopter. It can pretty much do any kind of maneuver. Anyway the question I wanna ask is, how does the motor/turbine from your concept more efficent then the original helicopter blade. - The turbine/motor surely would produce more friction. - and the safety net also stops the air thrust. Anyway the glider idea is brilliant! I have thought of one thing the helicopter can't do. That's kinda the whole idea behind my trampoline thing. Basically when u got a 100+ story building and you wanna rescue somone on the 50th floor, you can't do that wit a helicopter because a chopper's blades will hit the building if it gets too close. 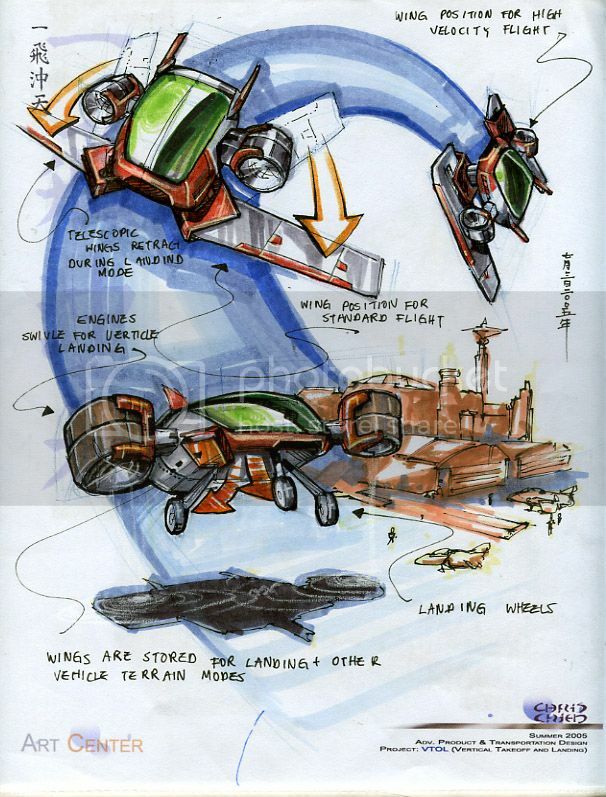 So that's where VTOL's have the advantage because the blades or thrust are always encased in something, so you can get right up close to the building or cliff or watever. And it would be impossible to have a netting thing on a helicopter cuz the ppl will jump right into the blades. 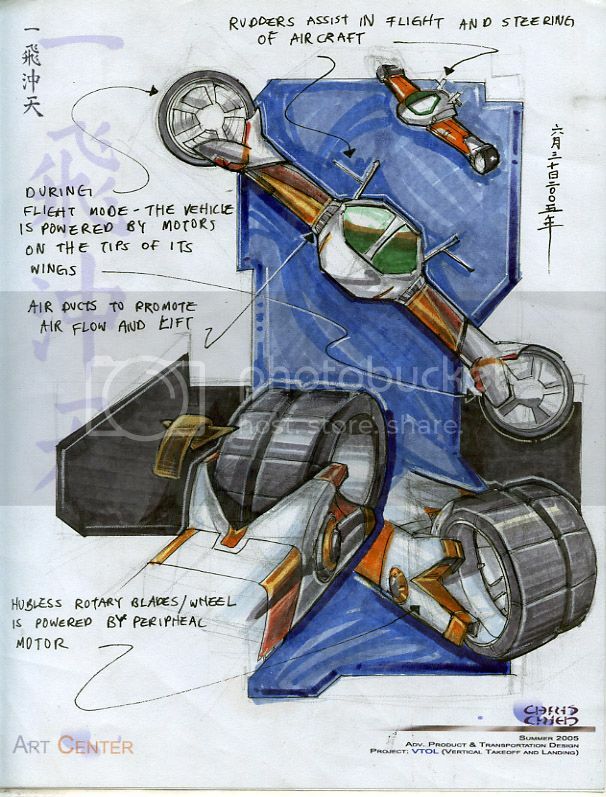 Another thing is that vtol's with those tilting turbines (like chris's) will go faster than helicopters in wing mode. And yes im sure both helicopters and vtol's r hard to control, but i guess the target audience is meant for professionals anyways. But i guess that's a good issue to address. I agree that motors/turbines create more friction, but that's why you have more than just one. Actually im thinkin of havin 4 on mines cuz i saw an existing vtol have 4 too. For the net stopping thrust, im gonna change that to an actual netting rather than a trampoline so that the air can flow right through it. And perhaps the net can just come out only when needed? I think what it comes down to is that yes, the helicopter blades are more efficient (as in energywise), but that's why you gotta find the helicopter's other faults and try to see if vtol's can fix those problems. r u commenting on Easystyle's sketches or mine. It seems like ur talking about his right? anyways, I have a word or two to say. In general, VTOL's advantage over an helicopter is that when it is in horizontal flight, it flys much faster and more efficiently. In Easystyle's case, the case provides protection for the blade. The vehicle can get near buildings without that much risk. If a helicopter were to go near a building, if one of the blades were to hit something, the helicopter could spin out of control and go crashing down. ps. i liked the glider too. 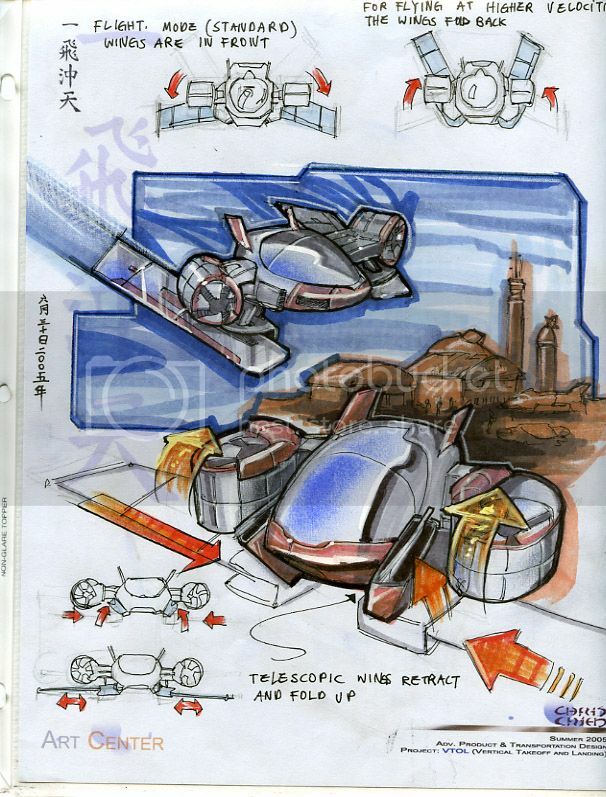 dan's glider was much more practical and better looking. 2 engines were in the front and back of the person instead of the left and right. And the wings unfold from the sides (much like a bat), and r completely concealed when folded. Mines is kinda ghetto. The whole idea was not havin to climb a mountain to get glidin. dan and i were coincidentally thinkin the exact same thing that week. haha ohh yeah, the helicopter's blade is a problem. I was talking about EasyStyle4747's glider, but I wanna ask you both about the turbine. Goodluck in your work dudes! maybe when i am free i will go to one of your saturday classes to see all this in person. looking forward to your cansons! the subject matter will make for interesting environments and situations. btw, this response is about what easystyle and the "bowl of noodle" said earlier when they were comparing helicopters and VTOL. helicopters have OPEN PROPELLERS while the kind of propeller you see in our peticular designs are DUCTED FANS which are inclosed. The advantage is that these ducted fans offer a high static thrust/horsepower ratio for a given diameter than open propellers. In addition, the effective diameter of the duted propeller is larger than its physical diameter by in open propellers is it is aspirating air from behind it as well as from in front. Thats why the ducted propeller you see in our designs is better than the OPEN PROPELLER of the regular helicopters. hey , i'm new here, but find all this stuff very interesting. i am not very good with rendering and mostly just design stuff. what i like to do is biuld them with paper. 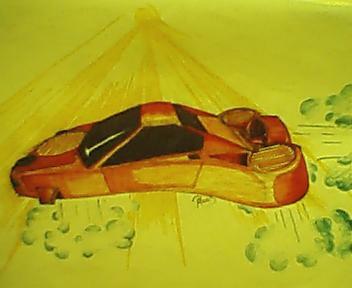 my site www.heading.forplanetearth.com shows my reconstructed starwars spaceships and some of my own designs. i also have realistic vtol type designs and models but those are not on the site.